Alubase Shadowline aluminium skirting from Studco Building Systems is an architectural shadowline profile for modern interiors, featuring a completely concealed fixing system and a clean line flush finish. 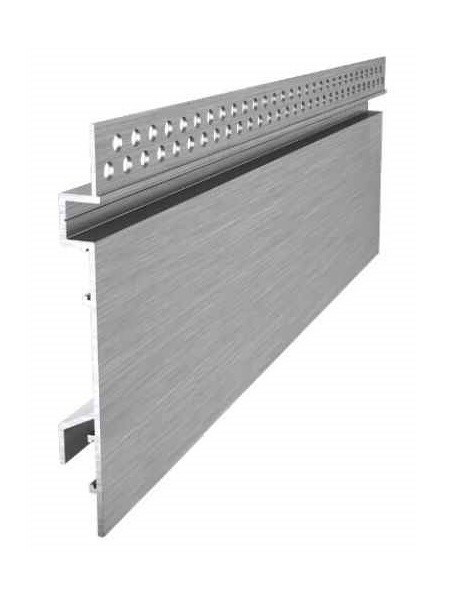 Conventional shadowline skirting boards are made from steel, aluminium and metal sections, leading to complicated installation and damage to the finished wall. Featuring a one-piece profile, Alubase Shadowline provides a distinctive 10mm x 10mm shadowline recess above a 90mm skirt to the floor line. Recommended for installation in any modern commercial or domestic space, Alubase Shadowline is designed and approved for use in conjunction with the Ezy-Jamb flush finish door jamb system, perfectly complementing the clean line finish of Ezy-Jamb and EZconcept products. Joiner tabs are provided to accurately align straight joins and corner intersections of Alubase Shadowline 3.6-metre sections. Key features of Alubase Shadowline aluminium skirting include single-piece profile manufactured from high quality aluminium; different profiles available to suit 10mm and 13mm plasterboard; concealed fixing system; crisp 10 x 10mm shadowline recess; perforated bead from trowelled finish; excellent resilience to wear and impact; and natural anodised finish.